ROTEX Infinity Actuators, the company's flagship product, are engineered to provide the longest possible service life with its exclusive Rotex V-Seal polymer double lip seal which offers the most efficient, dynamic sealing in the industry. Additionally, ROTEX Infinity Actuators offer massive bearings with greater surface area allow for higher load capacity, monolithic billet pinion provides for incredible strength and durability and two part epoxy paint over anodized aluminum body which gives superior corrosion protection. Infinity actuators are greater than the sum of their parts. 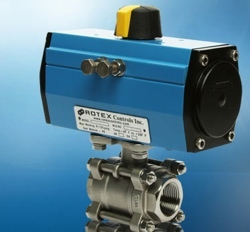 ROTEX Controls Inc. is also known for their industry-leading warranty. The ECV Infinity Series actuator is warranted for 3 years or 3 million cycles, including all seals. All major components, including body, pinion, bearings, springs, seals, and all hardware are covered for the full term of the warranty. No other actuator manufacturer stands behind their product with such a comprehensive warranty.